The exterior of 701 Haight St. Photo courtesy Haighteration. 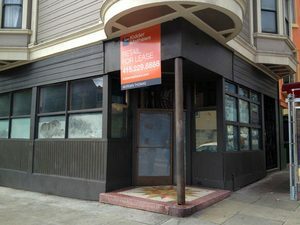 The Lower Haight is getting a new microbrewery, called ~BLACK SANDS~, according to Haighteration. The new venture is from Robert Patterson, co-owner of shops Revolver and Voyager, as well as the Mission’s Ken Ken Ramen. Some brewing friends of Patterson’s will be assisting with the project, and it sounds like the brewery will offer a variety of choices, including mead and an IPA. A kitchen will offer Japanese-style small plates, and you’ll also find coffee from Potrero Hill roaster Front. Right now, Patterson hopes to open in about six months, but the space is a former laundromat and will need a lot of work to become a brewery. When it does open, the interior will feature concrete counters and dark wood surfaces, and eventually outdoor seating. 701 Haight St. at Pierce.